Neither Huffman nor Loughlin or Giannulli has publicly commented on the allegations. They and about a dozen other parents are scheduled to make their first appearances in Boston’s federal court. 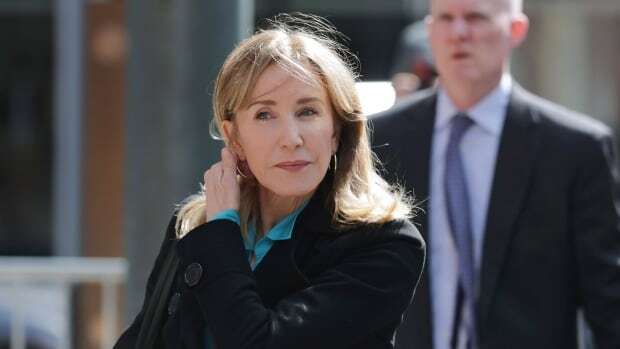 The Oscar nominee for Transamerica and an Emmy winner on ABC’s Desperate Housewives is accused of paying $15,000 US that she disguised as a charitable donation to cheat on her daughter’s college entrance exam. Loughlin, who played Aunt Becky on the sitcom Full House in the 1980s and the 1990s, and Giannulli are accused of paying $500,000 to have their two daughters labelled as recruits to the University of Southern California crew team, even though neither participated in the sport. Giannulli, whose Mossimo clothing had long been a brand at U.S. retail giant Target, is also scheduled to appear in court Wednesday. The Hallmark Channel — where Loughlin starred in popular holiday movies and the series When Calls the Heart, which has aired in Canada on CBC — cut ties with Loughlin a day after her arrest. Loughlin and Giannulli’s daughter, social media star Olivia Jade Giannulli, has also been dropped from advertising deals with cosmetics retailer Sephora and hair products company TRESemmé. Several coaches have pleaded not guilty, including tennis coach Gordon Ernst, who’s accused of getting $2.7 million in bribes to designate at least 12 applicants as recruits to Georgetown.